You may have heard of FERS deferred retirement – where you separate from service now, but start your FERS pension later. But you might also be eligible for a Postponed FERS Retirement. If you’re thinking about leaving federal service – it’s important to understand your options *before* you leave. 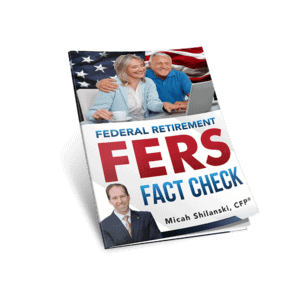 In the FERS Pre-retirement classes I teach, many people have heard of FERS Deferred Retirement. And a few people have heard of FERS Postponed Retirement. But very rarely have I had someone who understood the *BIG* difference between the Deferred and Postponed Retirement. Let’s talk about the difference between FERS Deferred Retirement and FERS Postponed Retirement. Then you’ll be able to click on a link that will take you to another page that has more details and examples about each one. But first, what is that *BIG* difference? FEHB. Your Federal Employee Health Benefits. With a Deferred FERS Retirement, you can start your FERS pension back up later – but you can’t start FEHB again. With a Postponed FERS Retirement – if you were eligible to keep FEHB when you separated from service – you can resume your FEHB coverage when you start your pension. As a federal employee, you have a phenomenal benefits package. Of all of the benefits you have as a federal employee… I believe that your *biggest* benefit is your ability to keep FEHB into retirement. But you can only keep FEHB in retirement if you meet certain requirements. And if you do a FERS Deferred Retirement – you can’t keep it at all. What makes the difference between a Deferred and Postponed Retirement? The difference has to do with whether or not you were eligible to take an immediate MRA+10 retirement before you separated from service. If you were *not* eligible for MRA+10 when you left – you can not do a Postponed Retirement – only a FERS Deferred Retirement (assuming you meet those qualifications as well). If you *were* eligible to do an immediate MRA+10 retirement when you left – you *can* do a Postponed Retirement. To do a FERS Deferred Retirement… you must..
Basically – you leave federal service now. You leave your contributions in the system. Later, when you reach a specific age (usually 62) you can start your pension. With a FERS Deferred Retirement, there is no minimum age to reach before you leave service – but you must wait until a specific age to start your pension. Click here to learn more about FERS Deferred Retirement, including sample pension calculations. Do you know your MRA? Your FERS MRA or Minimum Retirement Age is a number that plays into your eligibility for different types of FERS retirement. MRA is between 55 and 57 depending on when you were born. When you do a Postponed Retirement – you had the option to do an MRA+10 Early Retirement when you left federal service. But instead of taking a reduced pension, you wait until you reach a specific age (usually 62) to start your full pension. And if you were eligible to keep your FEHB when you separated from service – you can resume your FEHB coverage and keep it in retirement. Click here to learn more about Postponed FERS Retirement and to see examples of pension calculations. Let’s look at an example of doing a FERS Deferred Retirement and an example of a FERS Postponed Retirement. For our example, we’ll use Jane. Jane’s MRA is 56. Jane is 55 years old now, and she has 9 years of creditable service. For easy numbers, we’ll say her High-3 Salary is $100,000. Jane wants to leave federal service and take a job in the private sector. She’s trying to figure out whether she should leave now (and do a FERS Deferred Retirement) or work another year so she can do a Postponed Retirement. Let’s say Jane separates from service now. She leaves her FERS retirement contributions in the system. And when Jane turns 62, she can contact OPM and her pension will start. When Jane starts her pension, she will *NOT* be eligible to resume FEHB. In our first example, Jane separated from service before she was eligible for any type of immediate retirement. Jane decides to stay in federal service and work another year. At the end of that year she has reached her MRA, which for her was 56. We’ll say her High-3 stayed the same at $100,000 to keep the math simple. And now she has the required 10 years of creditable service. Now she *IS* eligible for an MRA+10 Retirement. She has the option of drawing her pension now – but it will be reduced. So Jane has the choice of starting her pension now. It will be $583/month – but she can resume her FEHB coverage as soon as she starts her FERS pension. But she also has the option of postponing her retirement benefits until later to avoid that reduction. If Jane waits until she is age 62 to start her pension, she will get the full amount of $833/month. But I think the biggest benefit here is actually Jane’s ability to keep FEHB in retirement. If Jane was eligible to keep her FEHB when she separated from service – she can now resume her FEHB coverage when she starts her pension. Even though there were several years between when she separated from service to when she started her pension… if Jane was eligible to keep FEHB if she had taken the immediate FERS MRA+10 Retirement… she can resume those FEHB benefits now as if nothing had happened. Everyone’s personal situation is unique. So what is best for one person may not be best for another. In general, if you’re close to meeting the requirements of MRA+10 Retirement… I think it makes a lot of sense to consider staying. If you’re close to your Minimum Retirement Age and you have close to 10 years of service, it might make sense to stay until you can do a Postponed Retirement. Or perhaps you’ve already reached your MRA, but you only have 8 or 9 years of service. If you punch out now, you can only do a FERS Deferred Retirement. But if you worked until you had at least 10 years of service, you could do a FERS Postponed Retirement. But if you aren’t close to your MRA at all – you may not be willing to wait to qualify for a Postponed Retirement. Let’s say you started working for the federal government when you were 20. You’ve got 20 years of service, and you’re now 40 years old and want to leave federal service. Even though you have more than 10 years of service, you would have to work for the government until you also reached your MRA (55-57) in order to do a Postponed Retirement. In this case it might not be worth it to wait that long if you’re anxious to leave. Either way – I think it’s important to understand your options *before* you separate from service. Also please remember that your federal retirement benefits are just one part of your overall financial picture. It’s important not to get wrapped up only in benefits – but to look at your entire picture before making any decisions. Thinking about a Deferred or Postponed Retirement? FERS Retirement rules can be overwhelming – but it’s important to understand them *before* you retire. If you’re thinking about retirement, you’ll want to sign up for our monthly E-Zine Newsletter. Each month we send out a new and original article on important concepts that will help you plan your federal retirement.